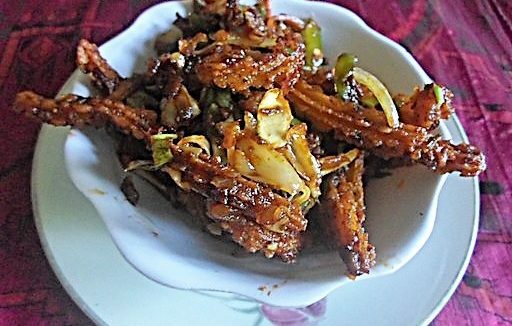 This is a Recipe for Spicy Mushroom Lazeez a popular Mushroom dish. This is a main course dish, which tastes great with Parathas, Rotis or Puris. Heat the Oil in a Kadhai and add Cinnamon, Cloves, Cardamom, Onion and fry for two minutes on a slow flame. Add Ginger-Garlic paste and fry for two-three minutes. Add Turmeric Powder, Green Chilies, Tomatoes and fry for two-three minutes on a slow flame. Then add Cashew nuts and Khas-Khas Paste then add Tomato Puree, Mushroom pieces, Coconut, ½ cup Water, mix it well and cook for five minutes. Then add Fresh Cream, Coriander, mix it well. Serve hot with a Paratha. While serving garnish with Coriander and Coconut.